Interesting that I managed to get in birthday wishes for the weekend of Edna Saint Vincent Millay’s birthday, but I let slip by the recent birthdays of Billy Collins, Lawrence Ferlinghetti, Frank O’Hara and Robert Frost. Ah well, with the exception of Lawrence Ferlinghetti, all of the others I have posted about quite a bit. I shall have to catch up to Ferlinghetti, and share a recent interview with you this week. But I’ve only recorded Dr. Angelou twice, recently with “Come and Be My Baby,” and also last year during NaPoRecMo, with “No Loser, No Weeper.” And with tonight’s recording it occurs to me that I don’t seem to put her big “serious” poems into my voice. I am not sure I have the proper gravitas for “Still I Rise,” and probably I’m the wrong voice for “Phenomenal Woman.” And after hearing her read her inaugural poem for President Clinton, I don’t think my reading of “On the Pulse of the Morning” could stand up to her own. So the one I’ve chosen to celebrate her birthday is lighthearted, though it has pissed some people off, frankly. Please keep in mind, especially if you are anti-smoking or vegetarian, poets don’t always write completely from their own point of view. The speaker in the poem usually has some personality traits and similarities to the poet, but the speaker is not always the poet herself. Sometimes we overstate things to make a point, or for the sake of humor. The story here is that Maya was at Ye Olde Health Food Diner in Los Angeles when she pulled out a cigarette to light up (she did quit smoking two decades ago though) and was chastised by the waitress. It really was meant in good fun, and I find the poem endearing. 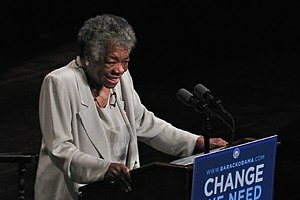 For more about Angelou and her views on food, please check out this blog where I got the above quote. It details her cookbook called Great Food, All Day Long, in which she extols the benefits of eating smaller meals, with good food in healthy moderation throughout the day. I’m not sure it will soothe the ire of some of her critics, but I am hoping to get a copy of it for my own kitchen. Love everything by & about Ms. Maya Angelou. Thank you The Dad Poet. Glad to have shared it with you. I am hoping not to have offended my vegetarian friends. Oh, Maya, Maya. One more reason to love her! Thanks for sharing (and reading) this! Another excellent read…heard her years ago reading her poetry at Ball State University in Indiana…was quite delightful. Oh that would have been fun. I went to Indiana Wesleyan U out there in Indiana. Seems a hundred years ago now. I would love to hear her reading in person. Nice reading — and, a treat, since I wasn’t familiar with the poem. And, although I’m vegetarian, I wan’t offended… to each, her own. Oh, good. One of my best friends is a vegetarian, and I’m lucky he’s in Memphis, otherwise I might get tickle-tackled over this. Yeah, we never did grow up.